I've only begun to use makeup fixing spray seriously within the last three years. I have no idea what I was thinking before then and I can only think out all of that wasted makeup and extremely oily face I had with a twinge of guilt. Now, let me tell you something for you guys who's living in a hot and humid country like I am- unless you enjoy having to re-apply your makeup for most of the time, a makeup fixing spray IS important. 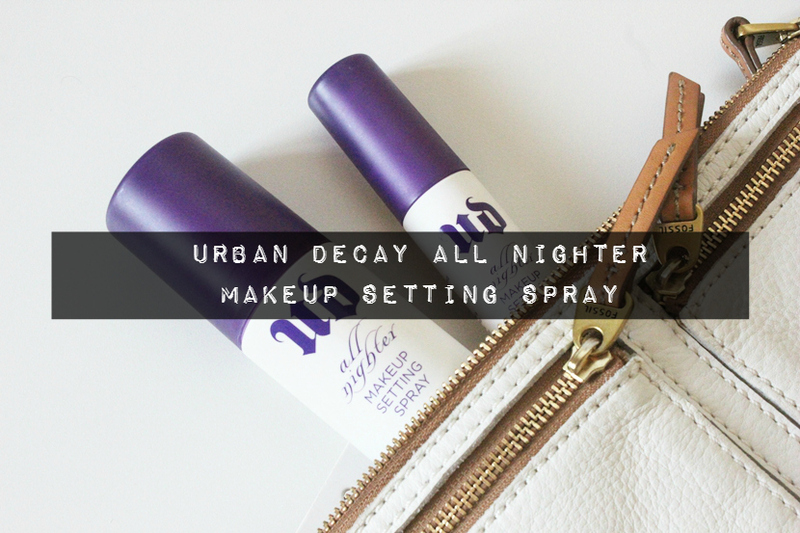 In this post, I'm going to review Urban Decay All Nighter Makeup Setting Spray and what makes it works in the first place. Let's get to the content, shall we? Believe it or not, some professionals claimed that "setting spray" and "finishing spray" are two different things. Setting spray is more like MAC Fix+, and Bobbi Brown Face Mist whereby they rarely have denatured/SD alcohol as the main ingredient but a lot of botanical extractions and oily components instead. Setting spray isn't designed to make your makeup to last longer, in fact, it will only allow all the pigments from your makeup to kinda hold together and become 'one' with your skin, hence the name 'set'. This will make makeup application to be less cakey, less powdery, and glowy. A makeup finishing spray (or fixing spray) does contain alcohol as the main ingredient together with some binding polymers such as Polyvinylpyrrolidone (PVP) and AMP-Acrylates. This kind of spray is used after setting spray and will form a facial film/layer to make your makeup last longer. So, in a way, the Urban Decay All Nighter Long Lasting Makeup Setting Spray is... misnamed?😅. Other examples of finishing sprays include Kat Von D Lock 'N Load Makeup Setting Spray and L'Oreal Infallible Pro-Spray & Set. After finishing 2 different brands of facial mists that didn't do anything in prolonging my makeup (they are just ordinary mists, a.k.a water/aqua only), I decided to venture out and bought an actual finishing spray. Remember, I was once a makeup noob, (not that I'm an expert or anything these days, but ya know ya girl here is learning), I could have upgraded my makeup game years ago if and only if I listened to makeup artists and stop day dreaming about how facial mists could make my makeup last longer. NYX Matte Finish Setting Spray didn't work well with my skin, so I finally settled down with the UD All Nighter. -A weightless setting spray that keeps makeup looking just-applied for up to 16 hours, without melting, cracking, fading or settling into fine lines. -Developed in an exclusive partnership with SKINDINAVIA, clinically tested formula is suitable for all skin types. -Features patented "Temperature Control Technology" that lowers the temperature of your makeup to keep foundation, eyeshadow, blush and concealer in place even in hot, humid, cold and windy conditions. -Formulated without parabens, sulphates and phthalates. 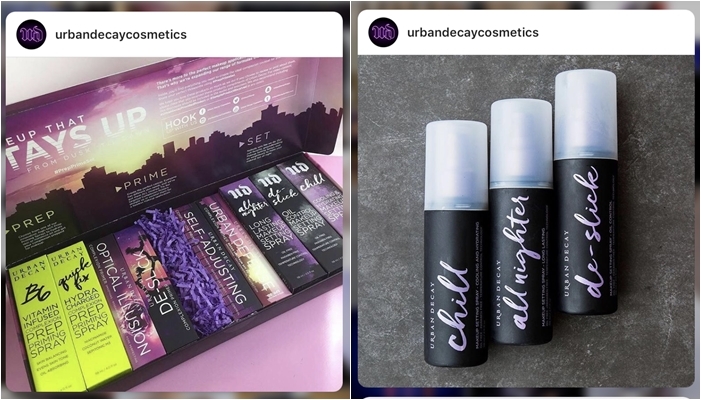 As for spring 2017, Urban Decay recently showcased the re-vamped packaging for the setting sprays via social medias that look more elegant, mysterious (if that makes any sense), and eye-catching (they say, I disagree). I like the one that I'm currently having, but they decided to change it into all-black because the matte white bottle gets dirty easily. The rubberized plastic material is quite similar to Nars cosmetics' signature packaging. It became sticky after some times and started to collect dust, fingerprints, glitters, pigments and all that jazz. I've yet to try any methods to clean it so I can't give you suggestions. Meanwhile, the new packaging will look something like the picture below, it's black but I do hope it won't turn out like Nars (still sticky and collect dust). And now let me present to you my un-glamour, dirty stained bottles. Because I loved this so much (spoiler! ), I got both in the full size and travel-friendly bottle. Keep in mind that I won't be discussing all but only certain ingredients that up to my knowledge. Aqua (Water/Eau), Alcohol Denat, Polyhydroxystearic Acid, PVP, Methyl Perfluorobutyl Ether, Methyl Perflouroisobutyl Ether, Dimethicone PEG-7 Phosphate, PPG-3 Benzyl Ether Myristate, Caprylyl Gylcol, Menthyl Methacrylate Cross Polymer, Poloxamer 407, Sodium Hydroxide, Sodium Cocamidopropyl PG Dimonium Chloride Phosphate, Glycereth-5 Lactate, N,2,3-Trimethyl-2-Isopropyl Butamide, Ethylhexyl Isononanoate, Isononyl Isononanoate, Fragrance, Aloe Barbandensis Leaf Extract. 1) Water is used as a primary solvent to keep other ingredients flowing, other solvents would be all the ethers. Then, just like most finishing sprays, there's denatured alcohol that serves a lot of purposes such as a solvent, viscosity controlling agent, evaporating agent and also astringent. 2) Polyhydroxystearic Acid is an emulsifier that functioned as a suspending agent and also dispersing agent, it's there to kinda make the finishing spray to become more emollient than having a stiff consistency like hair spray. 3) One important component that can be found in UD All Nighter is Polyvinylpyrrolidone (PVP), a synthetic polymer. This ingredient is what giving the film-forming property to your skin or simply, coat and sealing your makeup as well as making it last longer. You can also found PVP in a lot of waterproof cosmetics such as eyebrow coats and mascaras. One of the drawbacks of using PVP is its affinity to water, it will absorb moisture even from the air and we don't need that especially when we want our makeup to last long. That's why a silicone, Dimethicone PEG-7 Phosphate, and also silicone-like ester, PPG-3 Benzyl Ether Myristate are added and they will form another layer to keep the water out. 4) Another ingredient that sparks my interest is N,2,3-Trimethyl-2-Isopropylbutanamide and it's what creates a cooling sensation on the skin, well... apart from alcohol itself is very cooling. Meanwhile, Methyl Methacrylate Cross Polymer is a mattifying agent that will absorb oil from the skin. 4. Hold the bottle 8 to 10 inches away and mist face two to four times, in an "X" and "T" formation. 1. IT DOES WORK. (caps lock is necessary). Apart from it has gotten rid of any powder residue, this item has become a staple whenever I want my makeup to last longer and transfer-proof. I normally save it for special occasions, not for everyday use because like membazir what, later solat Zohor and Asar kena remove makeup jugak.. but of course, by all means, you can use it whenever you like. It keeps my makeup intact, however, not to the 16 hours as per claimed. If I'd to wear foundation in the morning, my skin (especially in the T-Zone area) would still get oily by the evening and when it's oily, my makeup gets everywhere. Maybe I should use a setting spray prior to this, but I don't have MAC Fix+ or anything similar to it right now and I'm sure my makeup could last a lot more longer if I'd to use them together. It takes a while to dry but the mist is colourless and it dries to a healthy glow finish, not dewy, not matte. Or mungkin aku sorang je yang rasa macam ni, lol. To be honest, I don't really have anything to complain but it would be good if the mist comes out more finer than it already is. I heard Urban Decay is upgrading its dispersing system in the new packaging? so I hope that's true. -Since UD All Nighter is technically water, don't spray it on the face if your mascara hasn't fully dried to prevent it from meltdown and ruining your foundation. -Also, due to ingredients like PVP and emollient silicones, do not spray this UD All Nighter before applying makeup or else you would end up looking cakey. It's not designed to prime, like the famous Smashbox Photo Finish Primer Water. -UD stated that the makeup setting spray is suitable for all skin types but I feel like those with dry skin would feel a bit "tight" and uncomfortable due to dryness. At least that's what I feel when my forehead is dry. Admittedly I was sceptical at first because of its price and claims, but I'm happy that it delivers and now it becomes a product I cannot live without. Urban Decay All Nighter Long Lasting Makeup Setting Spray deserves a 9/10 score from my personal rating system. I will repurchase and highly recommend it to everyone. This product retails at RM149.00 for a full sized bottle (120ml) and the travel-sized one (30ml) should be around RM60. You can get them at both Sephora and Urban Decay Concept Store. So, right! That's it. I'm done giving you some insight into the science behind a makeup finishing spray and I hope this would help someone out there other than myself. :D ((also, p/s don't miss my yellow box too much, it will come back soon since I'm a bit lazy right now to do some editing on that, hehe)). Copyright © 2017 ieyra h. Powered by Blogger.